Bunuelos are part of local cuisine all over Latin America. These delicious sweet-savory doughnuts came to Latin America from Spain and have evolved into various forms in different regions. These Colombian-style bunuelos are made with cottage cheese and/or farmers cheese, which are substitutes for a traditional Colombian soft fresh white cheese called "queso costena," and tapioca starch. 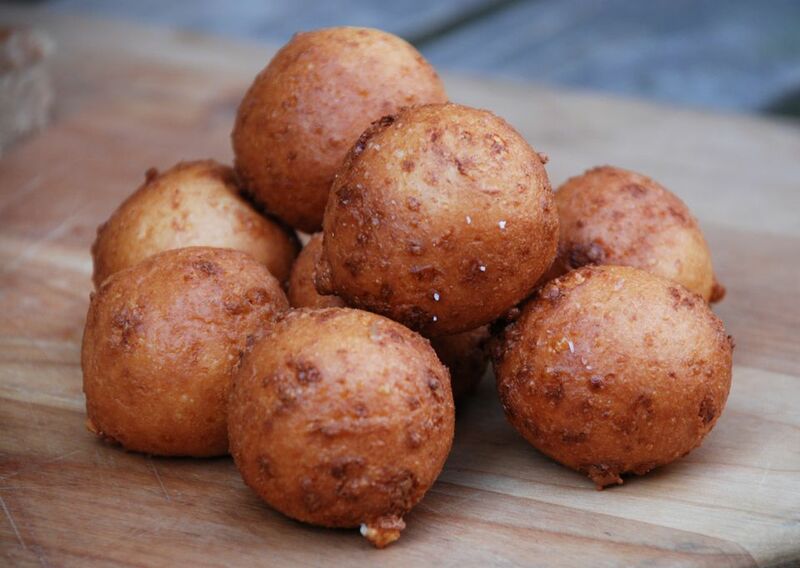 Colombian bunuelos are round and less sweet than some of the other varieties, such as Mexican bunuelos. They are a popular Christmas treat in Colombia, when they are typically served with a pudding/candy called "natilla." Bunuelos are great party food, whether for a Christmas celebration with friends or family or ringing in the new year. Because they are mostly savory -- cheesy -- but a little bit sweet because of the brown sugar and a dusting of powdered sugar, finding a festive drink to serve that will harmonize with the fritters is a head-scratcher. If you tend in the sweet direction, serve up hot chocolate, coffee spiked with Irish cream whiskey or Irish cream on the rocks. Hot toddies with honey are a bit less sweet and might be more to your taste. Or serve spicy orange tea spiked with Grand Marnier for a more neutral taste. It's all good on a cold winter's night.